ROME -- Seeking a way out after a second round of all-party negotiations foundered, President Mattarella on April 18 called for "explorative" consultations to be conducted by Elisabetta Alberti Casellati, 71-year-old attorney born in Rovigo and resident in Padua. 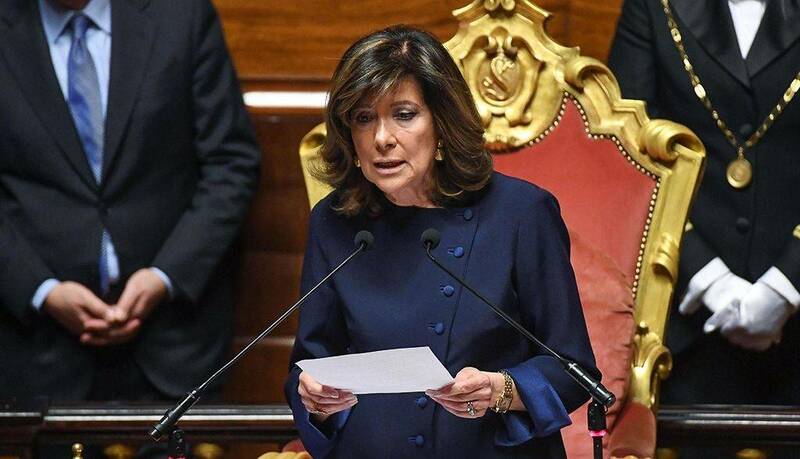 Casellati, who represents Silvio Berlusconi's Forza Italia in Parliament and is his staunch supporter, is the first woman to become Senate President in Italy. Her special field had long been canon law. "This opens a new political season," says the financial daily Il Sole-24 Ore. Despite there being no sign of an end to the crisis that began six weeks ago with national general elections, there has also been a bit of light relief. Back in 1594 the young Michelangelo Merisi, better known as Caravaggio, depicted three men playing the card game "primero," an early form of poker. 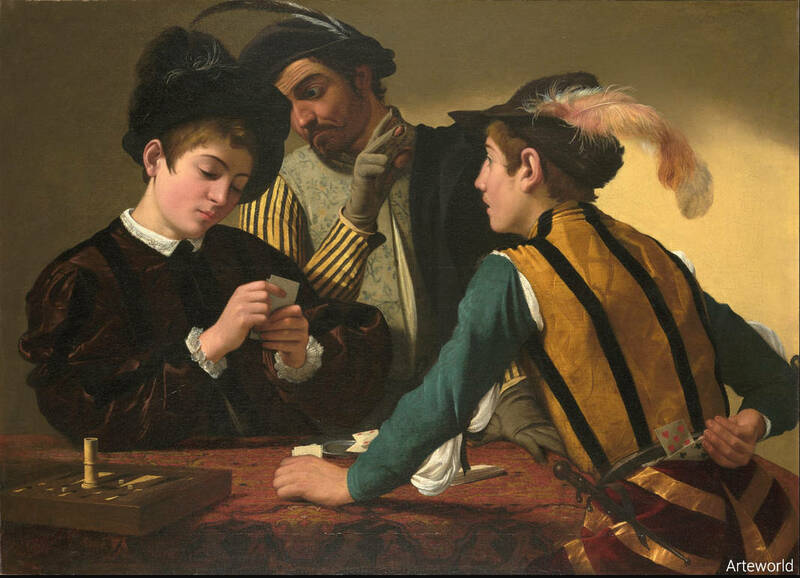 In this extraordinarily famous painting, "The Cardsharps," now owned by the Kimbell Art Museum at Fort Worth, Texas, a man hovering between and above the two young players slyly signals to the youth on the right the cards held by his opponent on the left. Last week a satirical version of this Caravaggio painting suddenly appeared on the wall of a building on Via de' Lucchesi a stone's threw from the presidential Quirinal Palace. 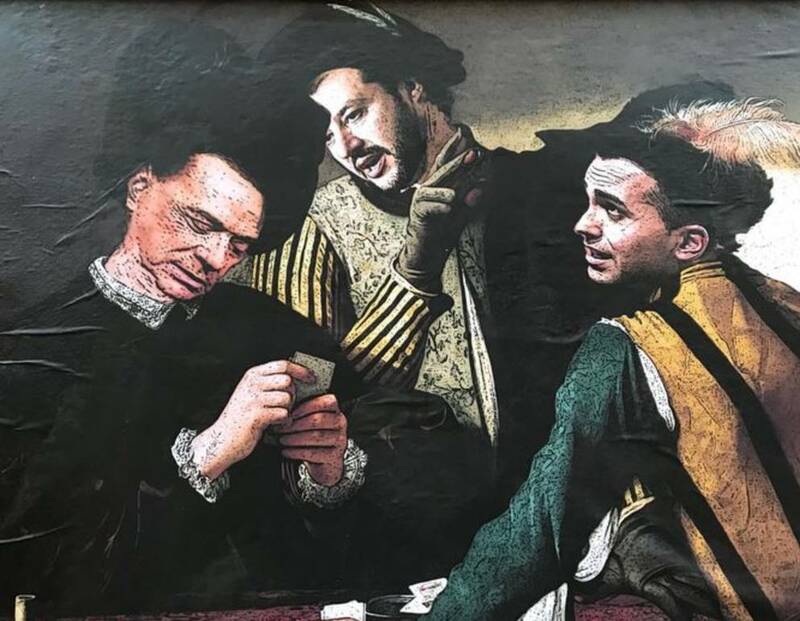 In this street art version, three of today's top politicians dressed in 16th century garb -- former premier Berlusconi, head of Forza Italia (FI); Luigi Di Maio, head of the Movimento Cinque Stelle (M5S); and Matteo Salvini, head of the rightist Lega -- are depicted playing cards. To the left is Berlusconi, in the center the sly and double-crossing Salvini and, on the right, Di Maio. As one Italian commentator put it, the painting showed "double crossing in action." Under the painting a caption declared, "An ingenuous old man [Berlusconi] is playing cards with his opponent, who, plotting with the adversary, cheats in the game of politics. This descriptive and realistic theatrical scene contains a moral warning: it condemns immorality [malcostume] and especially the strategies cooked up by the politicians." Needless to say, Carabinieri police immediately snatched the painting from the wall and presumably destroyed it, but not before the media pounced upon it, rebroadcasting its message, which was that Salvini and Di Maio were conniving against Berlusconi, supposedly Salvini's partner. Among the multiple reasons for the failure of these six weeks of all-party negotiations was Salvini's support of Russian leader Vladimir Putin in the tempest over responsibility for the alleged gassing of Syrian citizens, which left 40 dead. 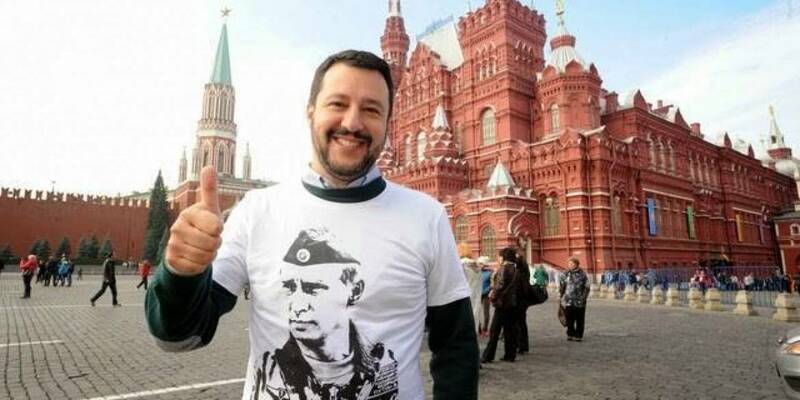 "The attack on Syria was a tremendous error," declared Salvini, who made one of his several visits to Putin in Russia last March. In a twitter Salvini added, "They are still hunting for Saddam's weapons of mass destruction, we are still paying for the crazy war in Libya, and the trigger-happy insist with intelligent missiles, helping among others the Islamic terrorists, who'd almost been defeated. It is crazy, stop it." Among those critical of Salvini's views was his coalition partner Berlusconi, quoted as saying, "In a situation like this it would be better to say nothing. The attack had precise objectives against sites linked to the production of chemical weapons." Most importantly, according to the conservative daily Il Giornale, Salvini, treading on the dangerous terrain of international relations, left President Mattarella "perplexed over whether he can entrust a leading role to Salvini, in a field that requires the gifts of prudence and diplomacy." At the same time some in the M5S sympathize with Putin's Russia; Manlio Di Stefano, in charge of the movement's foreign affairs, has criticized NATO for being too "aggressive" in East Europe. The challenge for Casellati is enormous, for she must again try to persuade Salvini's and Berlusconi's center-right to form a government together with the M5S. She has served six terms in the Senate, winning in Venice, where she won 42% of the votes. "I like politics and I hope to continue," she told reporters almost 25 years ago. "In my house everyone votes for Forza Italia, including my mother," she once said. Will she succeed? For the moment The M5S and the coalition now dominated by Salvini remain split over whether or not to include Berlusconi in a new government. Speaking for the left, Marco Travaglio, editor in chief of the daily Il Fatto Quotidiano, warns that Salvini should be careful of a breach with Berlusconi, as Di Maio is demanding. "It is very difficult and very dangerous for his allies to break with Berlusconi. He is used to slamming, with his TV stations and newspapers, everything that gets in his way." And at any rate Italian politics remain a waiting game until the results are known for regional elections, being held in Molise in the South on April 22 and, in the North, in Friuli Venezia Giulia on April 29. At that time the relative strengths of the Movimento Cinque Stelle, the Lega and Berlusconi's Forza italia will be tested. At any rate, said Travaglia, "Casellati will go to the parties to ask questions whose answers she already knows. She knows that the M5S will never go into government with Forza Italia and hence, with due respect, she will go into an exploratory period that can lead nowhere at all. And in this way we shall finally rid ourselves of that swindle that is called center-right. It is a fake coalition."